Clinton County Solid Waste District Coordinator Jeff Walls shows a glass keepsake as an example of something that could be done in relation to the courthouse’s centennial. Jennifer Hollon, right foreground, shows a photograph of the official laying of the courthouse cornerstone. In the background from left are Clinton County Commissioners Clerk Diana Groves, Clinton County Commissioner Brenda Woods, and Clinton County History Center Director Kay Fisher. 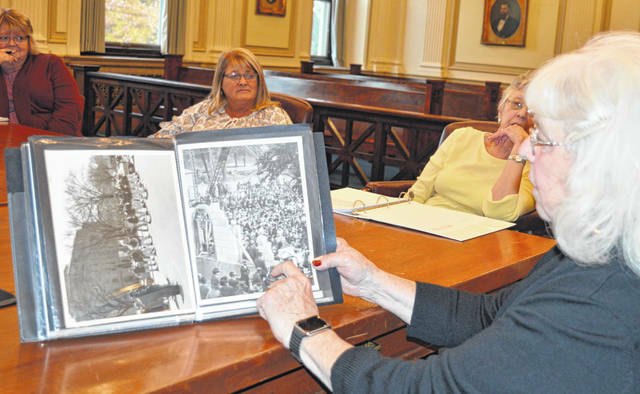 WILMINGTON — There were a variety of ideas floated at a gathering on how to celebrate the 100-year anniversary for the opening of the county courthouse. The unveiling of an historical marker on courthouse square is one thing settled upon already. But the courthouse will be showcased next October in other ways too, and some of those options were brought up Thursday in the first official planning session. Clinton County Commissioner Brenda K. Woods, who is chairperson of the planning group, said one sure way to draw a crowd to the event is to present a countywide high school concert, whether it be choirs or bands. The parents of participants would come and probably sample other pieces of the centennial-related lineup while there. Guided tours of the courthouse, which is known for its beautiful architecture and artistic rotunda, are anticipated. The tours may be led by people in 1919-period costumes. 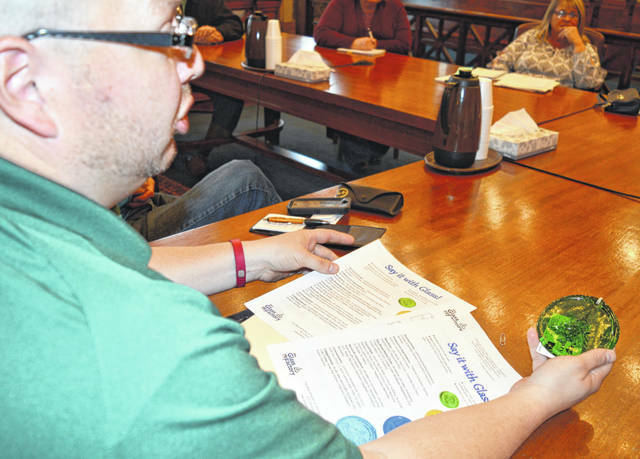 Clinton County Solid Waste (Recycling) District Coordinator Jeff D. Walls suggested a glass keepsake or souvenir that bears an image of the courthouse. A Georgetown glass-works plant — where they utilize glass bottles they recycle on site — has reasonable prices, he said. Jennifer Hollon suggested the possibility of placing bunting on the courthouse exterior. An idea previously raised — showing off the courthouse’s compact dome with floodlights after dark — will be revisited by commissioners, said Woods. This courthouse is the third one for Clinton County. There are no photographs nor known sketches of the first one, completed in 1813 at a cost of $1,742, said Clinton County History Center Director Kay Fisher. She plans to contact the University of Cincinnati School of Architecture to see whether a student there can, for a project, create a rendering of the first courthouse based upon a description. There’s a shovel still around that was used at the current courthouse’s groundbreaking, Fisher advised. The prospect of letting people see the tunnel under the courthouse — normally off-limits — was mentioned during the planning session. Woods said when a person goes beyond the tunnel and down into the old boiler room, the “stairs are very narrow and very steep beyond the tunnel,” and she would be concerned about somebody getting injured and the liability issues. A couple different times Clinton County Common Pleas Judge John W. “Tim” Rudduck said he didn’t want the event to be politicized, for example by inviting certain state officials to the ceremony. Another thought for the anniversary is the possibility of a courthouse-themed art project or contest. Woods is asking the public to contact her if they have courthouse-related photographs, pictures, or artifacts they would be willing to share for the occasion. She can be contacted via the commissioners office at 937-382-2103 or on her mobile phone at 937-302-6800.